This is the eighth article from 中文天天读. 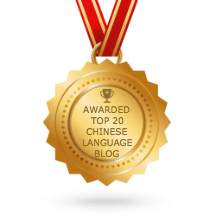 “赶紧” is an adverb that means “doing something against time or in a hurry”, usually put before a verb. “一下子”, adverb, means “in a very short time”and is usually put before a predicate adjective or verb. At this moment, I suddenly realized why Dad had put the character upside down. like to paste the word “fu “. Note:倒upside down and 到 to arrive are both pronounced dào. These couplets usually are pasted beside their doors or on the walls outside. 门上 should be translated as “on their doors”. “beside their doors” is 门边. 除了, in this context, means in addition or besides.